An earlier draft of this document was prepared in response to a specific request by the SOPAC (South Pacific) countries as background information for the United Nations Conference on Straddling Fish Stocks and Highly Migratory Fish Stocks, New York, July 1993. Although maximum care has been taken in its preparation, it may still contain some inaccuracies due to the very scattered information available for some stocks or fisheries. This review was prepared by S.M. Garcia with the collaboration of J.F. Caddy, J. Csirke, D. Die, R. Grainger, J. Majkowski, and the staff of the Fishery Information, Data and Statistics Service. The final draft was edited by D. Spencer and L. Garibaldi, and finalized by J. Werry and R. Sola Ronchetti. Drawings were provided by P. Lastrico and E. D'Antoni. World review of highly migratory species and straddling stocks. FAO Fisheries Technical Paper. No. 337. Rome, FAO. 1994. 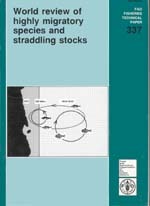 70 p.
This document provides information on the fisheries and state of stocks of a number of highly migratory species and straddling stocks. The section on highly migratory species covers the species listed in the relevant annex to the 1982 Convention on the Law of the Sea, such as tunas, billfish, marlins, oceanic sharks, marine turtles, pomfrets, dolphinfish and sauries, and also other species of actual or potential importance to high seas fisheries with migratory behaviour not listed in that annex (such as tuna-like species, squids, oceanic horse mackerel, etc. ), of which very little is known. It does not cover marine mammals and salmon. It concludes that many of these resources have been severely reduced or depleted, illustrating the non-sustainable nature of today's exploitation of the high seas. The paper also reviews the major straddling stocks, region by region, identifying the species involved, the fisheries and, whenever possible, the status of the stocks and the management problems. It shows that there are more straddling stocks than those which have attracted international attention. It underlines the importance of pelagic straddling stocks particularly around island countries, and highlights some of the management problems. In the decade following the adoption of the 1982 Convention on the Law of the Sea (hereafter referred to as the 1982 Convention), the redistribution of the seas' wealth has proceeded as anticipated, with a few coastal States gaining large benefits and a few distant-water fishing States incurring large losses. Several developments were not foreseen, however. Most notable are the continued investment in the capture sector, often beyond economic rationality, and the significant growth in fishing effort on the high seas beyond the 200-mile limit. Since the early 1980s, the growth in the world's marine catch has come from five low-value species1 while most fisheries on high-value species had reached plateaux in production, with the exception of some of those exploiting tunas, tuna-like species and cephalopods. Notwithstanding, fleet sizes continued to increase. Since 1970, the world fleet has increased twice as fast as world catches. As a result, the excess fishing capacity2 has reached alarming proportions and the returns on capital consume 46% of the annual total revenue earned from all landed catches. Faced with declining catch rates, part of the excess capacity has been transferred to other EEZs (when economically accessible) and to the high seas. Marine catches reached a peak of 86 million t in 1989 and since then have decreased three years consecutively for the first time in the history of fisheries. Reported catch statistics for selected straddling and highly migratory species are given in Table 1. It is estimated that to rehabilitate fisheries to the 1970 abundance levels and catch rates would require the removal of 23% of the existing Gross Registered Tons (GRT) of the world's fleet, approximately 5.8 million GRT, at a cost of around US$ 73 000 million (replacement value). It is also estimated that the levels of government subsidies are at about US$ 54 000 million/year (FAO, 1993a). Few States have implemented legislation governing the rights and obligations of their vessels fishing on the high seas. Where States have implemented controls and accepted restrictive measures, becoming contracting parties to International Fisheries Conventions, some of their fishing vessels have changed flags in order to evade regulatory measures. The overall implication of reflagging is not well known since States providing flags of convenience do not report, but, according to Lloyd's Register of Shipping, it would involve more than 1 000 vessels or approximately 20% of the fishing vessels of 500 GRT and over. The responsibility for this situation under Article 117 of the 1982 Convention rests with the Flag States. As a consequence of the poor state of high seas resources and international conflict between coastal States and distant-water fishing nations, the issue of high seas resources management has come to the forefront of international attention despite the fact that such fisheries produce only 10% of the world food supply. UNCED focused on the issue when developing its Agenda 21 (Chapter 17) for the protection of oceans, elaborating the framework of an international programme for the conservation of marine living resources in the high seas (Programme 17C). FAO organized a Technical Consultation on High Seas Fishing (FAO, 1992b). UNCED recommended an intergovernmental conference on straddling and highly migratory fish stocks that was held in New York in July 1993. As a contribution to the international process and, more specifically, as a contribution to the UN Intergovernmental Conference, this document provides information on the composition, fisheries and state of the stocks of a number of highly migratory species and on straddling stocks. It also reviews the major straddling stocks, region by region, identifying the species involved, the fisheries and, whenever possible, the status of the stocks and the management problems.